Doreen Virtue surprised the Angel Community and New Age world when she announced she would no longer do Mediumship and would be withdrawing her name from anything associated with tarot cards. In a video she published on YouTube, click to watch, she talked about an experience where she saw Jesus and went on to explain how that experience has changed her life and her relationship with God. Her announcement has caused quite a reaction with the Angel and New Age communities. I don’t claim to know Doreen or have ever talked to her. In this post, I will outline some aspects of her design that can explain why her energetic design supports and possibly precipitated this change in direction and belief. The most prominent thing in her chart are her completely open centers. The head being open indicates she is completely open to ideas and inspiration. Her identity being completely open means she has the potential to be heavily influenced by her environment and those around her. Doreen grew up in a religious setting with her parents being Christian Scientists. Note, that two strong influences with Christian Science are focused prayer and the bible. With an open identity center it is likely Doreen absorbed these teachings, in Human Design we would call this conditioning. Her open head would have been a great facilitator over time as she discovered her gifts, seeing and communicating with spirits and Angels. The open head would have allowed unlimited ways to process these experiences and interpret the meaning of them. As these grew and her reputation grew to be an expert Doreen took on the identity of medium, psychic and the Angel lady. In teaming up with Hay House, she became quite prolific in producing Angel cards, Tarot cards, books and trained thousands of practitioners to use their intuition and communicate with spirit. Her open identity more and more took on these personas. The open identity craves love and to be reminded they are loved, so how could she resist a metamorphosis with this flow of followers, students and worshipers? Even in her personal life there is evidence of this need for love and not having it fulfilled, as she is currently on her 5th marriage. Doreen says in the video that her Christian roots were always there but when she tried to express it within the New Age community there was push back. This would be a classic dilemma for the open identity, trying to push forward with something you believe in yet not being supported, not loved, by the New Age community you are immersed in. Doreen has two other factors in her design that play a prominent role in her shift. Her profile being a 1-4 is determined to get foundation. Both lines support foundation by getting foundation in detail and getting foundation in community. In her cards and books you can see she is quite foundational with the detail of the words and illustrations. 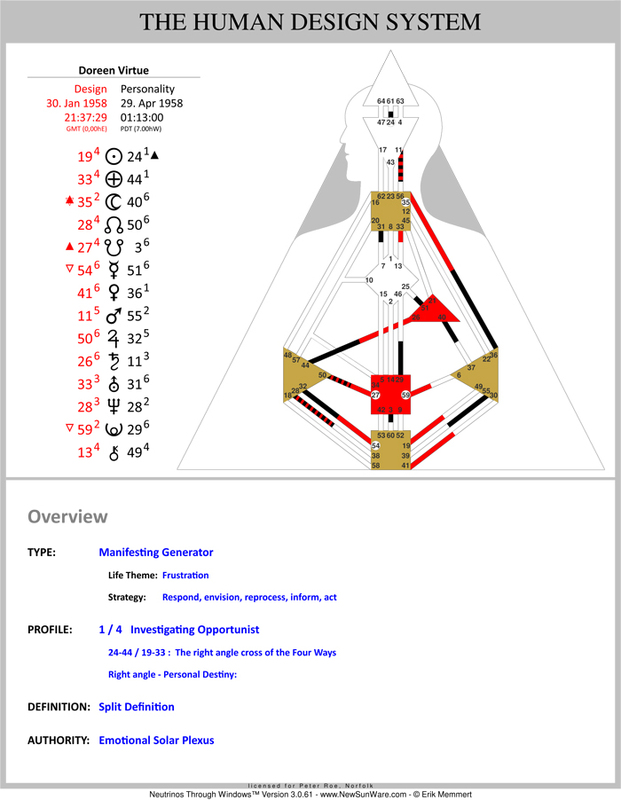 In addition, her lead energy is the gate 24, reincarnation, an energy that mentally goes over and over things, trying to polish the rock until it is round, trying to figure how to fit a square peg into a round hole. When Doreen married for the 5th time her world had already changed. She had taken a less involved role overall, where her son Charles had taking over the training programs. She entered a more Christian world, finding a church and becoming a regular member with her husband. So with dilemma of trying to fit her Christian belief into the New Age persona she had grown into, the 24 had her likely pondering how to make these two worlds fit. Her 1-4 profile would have pushed her to get foundation and through these 2 forces it appears a mutation occurred. When the mutation occurred, she had to make changes to allow her changed internal identity to fit with her perceived outward identity. While it must have been tough to announce this change, her channel 36-35, which is to have gone through an experience and know whether you are done or not, helped her to move on in the direction to support her new identity. This likely play a role in her moving on from the 4 previous marriages as well. I don’t doubt Doreen had a mystical experience with Jesus. I am just presenting that these energies in her design would support the outcome that we have witnessed. I also don’t think it discounts or diminishes the cards, the books, the training that she has given in the past. Those were produced by the identity of Doreen at that time, and as we can see here and open center has the ability to change and or mutate. You can see Doreen’s full report here. You can order a report for your design here.